Astronomy Israel: "Curiosity" Rover Party Party Party!!! The Mars-bound Curiosity Rover is scheduled to land on the surface of Mars on Monday, August 6, at 8:31AM Israel Daylight Time (IDT). To honor and celebrate the most complex and difficult mission NASA has ever done for a robotic explorer we will have an impromptu party at the CafeNeto in Mitzpe Ramon, starting at 8:00AM on Monday morning, August 6th. NASA will be streaming live video of the event from their web site which we will watch using the CafeNeto's wifi connection. Bring along a computer, tablet, or smartphone and you can stream from there, too. Of course the CafeNeto will be serving their always exceptional drinks and food, and Ami's convenience store (all kosher) is open next door for those who wish to roll their own. 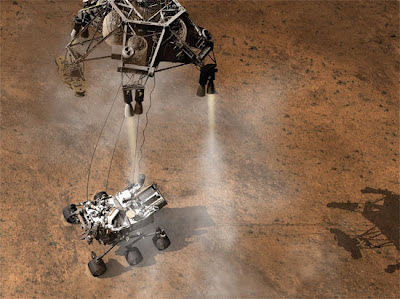 Curiosity Rover is lowered to the surface of Mars by its hovering sky crane. It seems that parties are being held all over the world for this event, including one that NASA is hosting in Times Square where the landing will be streamed onto the Jumbotron at 42nd street. This could be even bigger than the Facebook IPO, and it won't cost you a cent! List of Curiosity landing parties around the world. Find your nearest one! The seven minutes of the landing has been described by NASA as "seven minutes of sheer terror", as Curiosity goes from a cosmic velocity of 13,000 MPH to zero through its landing sequence to finally be lowered to the surface by a hovering sky-crane using over 70 pyrotechnic elements that will finally fly the sky-crane safely away from Curiosity where it will crash to the surface of Mars. It takes transmissions from Curiosity 14 minutes to reach earth, observing the universal cosmic speed limit of 186,000MPS, so mission operators won't know whether Curiosity has survived its seven minutes of terror for 14 minutes after its landing. The 8:31 landing time is calculated to include the 14 minutes of transmission delay, so the actual landing will occur at 8:17AM IDT. Come and join us as we find out the ultimate fate of the greatest robotic mission to the planets ever undertaken by mankind! Your post is really well written and insightful. Glad I found your website, warm regards from me!